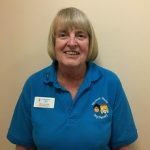 Alison started at the Lancaster Nursery over 40 years ago as a Nursery Officer after receiving her training and her N.N.E.B with the Church of England Children’s Society, she progressed to Deputy Manager before becoming Manager in July 2001. Alison has seen many children come to play, learn and grow within the nursery over the years, seeing some of them return with their own families. I am dedicated to my role and providing a friendly and homely safe environment for all children to thrive in and a high standard of care. 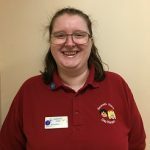 Ally joined the nursery team following her placement with Lancaster & Morecambe College during her training in August 2006. Ally is well known within the nursery for her outgoing, sunny personality and also for her brave Sponsored Tandem Sky Dive for the nursery in 2011. Ally was promoted to full time Deputy Manager in February 2013 and has NVQ level 4 Diploma in Management. It is safe to say no day is ever the same when you work with children. It’s a thrill to see children enjoy the nursery setting and grow into their individual characters as they get ready to move onto school. Vicki joined the nursery team in September 2004 and ensures the clerical and financial side of the nursery runs smoothly. Vicki has over 20 years experience in administration, with over 10 years experience within in a nursery setting and has also a BTEC level 3 Diploma in Business Administration. 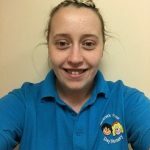 Vicki is always available to offer advice and support to existing and potential families, welcoming them as they arrive into nursery. This is the first job I have ever felt content and settled in. I work with a great group of people and I enjoy getting to know the families, I love my job! Sal joined the nursery in September 2011 and takes pride in offering a balanced nutritious diet and uses only the finest fresh produce. Sal’s meals are all home cooked and any children with specific dietary requirements are catered for. 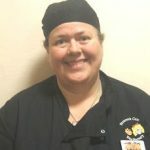 Sal has been a nursery cook for over 20 years and has a Diploma in Human Nutrition and Level 4 Food Safety. I enjoy cooking for under 5’s as they’re finding out what foods they like and nutrition is of the utmost importance.